MARC Madness: Round 2 over! Bring on the Sweet Sixteen! Check out the number of close matches all over the place! I think there are some favorites emerging. I’m envisioning a Final Four, but not sure about all of them quite yet! The brackets are updated! The new round begins… NOW! 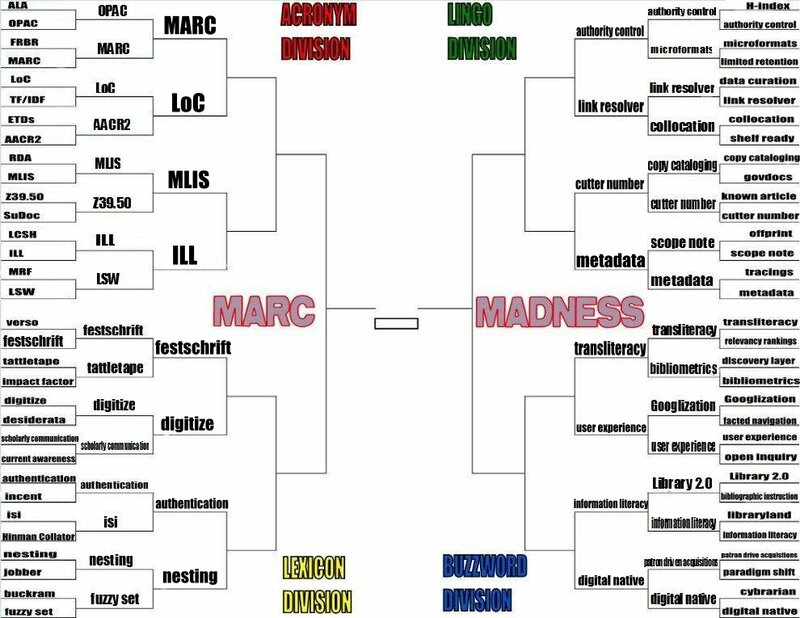 What will be the Elite 8 of library terms? Voting ends Saturday! I wanted to make a quick note of my second anniversary blogging. I’m looking forward to what the next year will bring. I’d like to thank everyone who subscribes for their support, those who take the time to comment for making this blog better, and everyone who finds their way here. 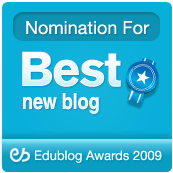 I love writing in this blog and I’m happy that there are people who enjoy reading it. Earlier this week, I had the chance to attend two days of the Computer in Libraries conference down in Washington D.C. I could see why some of my librarian friends really like the conference: it’s big but not too big; there is always at least one topic at any given time that is appealing; and that it attracts some of the well known librarian thinkers and innovators to attend and/or present. Overall, it was a great experience to hear some new ideas and perspectives, to meet people that I only conversed with online, and do a bit of networking. I left feeling professionally rejuvenated. The site of the conference was the Washington Hilton, sprawling complex of a hotel that felt like you needed a passport to go from one wing to another. It’s claim to fame is that it is where the attempted assassination of Ronald Reagan occurred; the 30th anniversary of which will be on 30th of this month. While the entrance where the shooting happened has been redone, you can still see the resemblance of certain details when you look at the pictures from that day. It’s also the location of the annual White House Correspondents dinner. From the same stage that Presidents and comedians tell their sanitized humor, each day’s keynote and one track’s worth of presentations filled the ballroom. In the end, I left the conference with more questions than answers. I sat on the dark train car on the way back Tuesday night, pondering and organizing all the presentations and conversations of the three previous days. I don’t think that having more questions after a conference is a bad thing. I think you should go into a conference with questions, get them answered (or something like it), and then leave with more curiosities than you started with. One such set of sessions that set my neurons into motion was from Internet @ Schools on Monday morning. In talking about the issues around eBooks in the school setting, one presenter said something that really caught my attention. “Perhaps schools are not yet ready for eBooks”, I remember her saying (I wish I could remember who said it). I thought this was a bold statement as the push has been to work on getting eBook integration into the classroom. Her reasoning is that eBook licensing and devices have not arrived at a point that make both fiscal and logistical sense. I can understand what she means in the fiscal sense; the devices are still mainly proprietary and highly transitional. The next generation is but a few months away, not exactly something a school budget planner needs to hear. As to the logistics, the restrictions on books in terms of licensing and DRM does create additional barriers to eBook and eReader collections. Add in the varied needs of the student body from age range to reading ability and it makes for an incredible amount of effort going into a collection in which there are limits to material control and device compatibility. On top of that giant mess is the end user who needs something that can be easy to understand or present an easy learning curve. This is not withstanding the efforts of Buffy Hamilton and her work with using Kindles with her high school. Buffy is doing important and pioneering work in integrating the eReaders into the lives of her students and the faculty. I do not know of any other cases of experimentation at this kind of level; to be honest, I wish there was more projects like this to give a better data picture. And while I would characterize Buffy’s project as a rousing success for both her school and her library, it comes down to a question as to whether that success can be replicated in other venues. Under a different funding structure under a different set of state laws, could that success be duplicated? I’ll bring back around to the original question posited: are schools ready for eBooks? What are the remaining barriers (if any) for their integration into the school collection? The thing that really stuck with me from his talk is in regard to the eBook endgame. Namely, what is it? It is not a matter of current formats and devices, but how information intersects with the learning style of the person. That we as librarians can argue about how many checkouts an eBook can have, the proprietary nature of devices, and the ramifications of a licensed collection but the greater issue is how our end users take in information. In addressing the different types of learners, the answer moves from simple text to embedded video to interactive experiences. It’s not simply a matter of text on a device, but the context in which that text or other multimedia is presented. In leaving that session, I began to wonder. Can we imagine what our collections will look like in twenty years? Ten? Even five? Will the Kindle or HarperCollins or DRM matter? Over time, will the market (meaning consumers) move away from locked down devices, away from licensing content, and from all but the lightest of file security measures? Based on how the music market changed, I would say yes. So how do we meet them at that end? What is our role in getting there? In bringing out these two points, this is not to say that I didn’t enjoy the other presentations (although some were certainly better than others). The conversations I had with people I knew from their Twitter or blogs or Facebook were pretty awesome as well as the new people I met at the conference itself. It reinforces that social aspect that I think works to make for a better library community as whole; we just don’t get enough face to face time that builds stronger social bonds. It’s a shame, really, because this would be a good time for such kinds of meetings. Perhaps I’m being a bit too cynical in regards to online interactions and their new role in people’s social lives, but I digress. I hope that my fellow conference attendees left with their own questions. I’m keeping my eye out for their tweets and posts. And I certainly look forward to seeing everyone again at another conference, hopefully before CIL 2012. 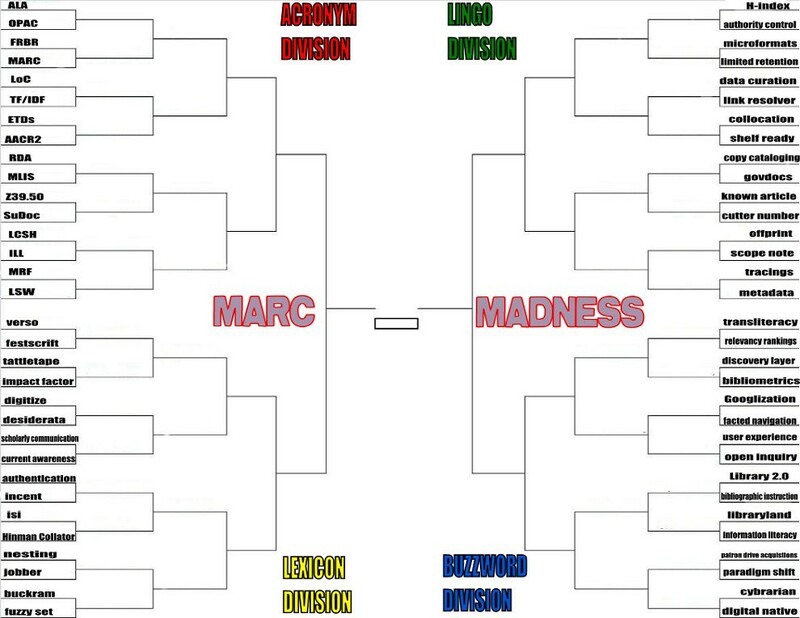 MARC Madness: Round 1 Results! Round 2 Starts! * I managed to misspell both, so they were equally handicapped. Click on the graphic to embiggen. Onwards to Round 2! Voting ends Wednesday night! For the last couple of days, that Time article on the emergence of the sharing culture has really stuck with me. It settles on a single question: are librarians missing opportunities to create other lending or sharing networks in their respective communities? I think in helping our communities create their own lending and sharing groups and cooperatives that it provides a different sort of outreach that benefits the library. Rather than take on all of the responsibilities and duties of a full lending collection, the library acts as a consultant and mentor to community members to form their own viable lending/circulating collections. It takes the sharing and lending values of the library and puts them into the hands of the people that we serve. I believe that by instilling those qualities into these kinds of lending entities that the overall mission of the library is furthered as well as creating advocates for the ethics that librarians seek to further. If we truly believe that the philosophy of the library goes beyond our walls, then it behooves us to work towards additional lending and sharing models in our respective communities. In doing so, we put our principles and practice above our own limitations and create a greater lending and sharing culture. I believe it will work towards furthering our own viability in the future since it sinks the roots of the library deeper and further into the lives of our service areas. 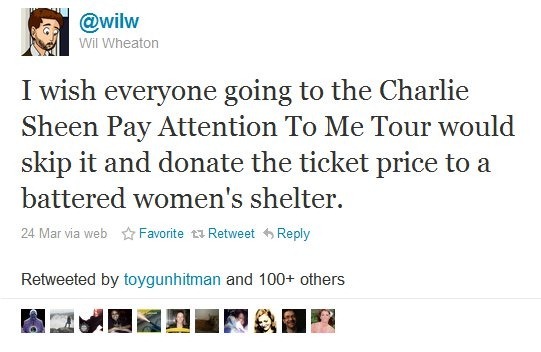 Inspired by Wil Wheaton’s tweet, I set up this wiki. The short version is that it is a call to action for people to donate the cost equivalent of a Charlie Sheen ticket to charity. There is a short list of possible places to donate, but as I note in the wiki, it is not an exhaustive list. The important thing is to donate. I encourage people to share the wiki with others and spread the word. Click HERE for Round 1 voting! 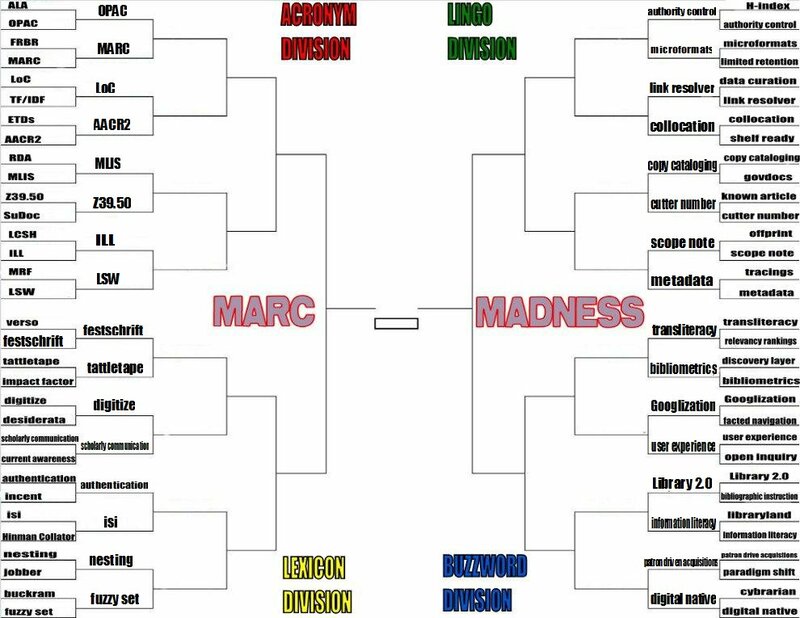 The voting for Round 1 of MARC Madness: The Tournament of Library Terminology has begun! It will run from now through Sunday night. Winners and the next round of voting will start Monday night. 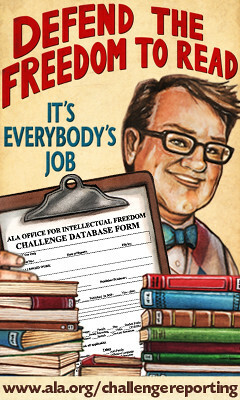 Vote early, vote often, and get your friends to vote as well for your favorite library terms!